This colorful piece from ancient Egypt is actually only a fragment of what would have been a larger funerary mask, meant to adorn a mummy in preparation for the afterlife. The fragment depicts typical funerary iconography and adornment, including chest pectorals and a type of broad necklace called a wesekh collar (meaning ‘breadth’ or ‘width’), which was an important symbol associated with death and divinity for over a millennium in Egyptian history. This fragment was made of a material called cartonnage, a papier-mâché like substance that appeared in the First Intermediate Period, but was used in the construction of funerary masks and anthropoid sarcophagi with increasing frequency during Egypt’s Late, Hellenistic, and Ptolemaic periods. Cartonnage could be created through a number of techniques, but most commonly consisted of layers of linen or papyrus scraps covered with gypsum plaster, that was molded over the mummified body, then painted after it hardened into a shell. Because of the smooth surface, some of the painting was quite detailed and delicate. Cartonnage mummy sheaths were a more affordable option than the wooden sarcophagi and masks used by the upper level nobility. We have some later examples that leave the space for the deceased’s name blank and, in the 26th dynasty, the Egyptians even started to make the sheaths in 4-6 separate pieces, indicating mass production. However, cartonnage mummy sheaths were still luxury goods, and later Hellenistic examples were often gilded. Due to the fragile nature of the material, we do not have as many examples of cartonnage sheaths preserved as other types of funerary equipment, such as wooden coffins. However, most preserved pieces we do have come from the mummy masks that were made to cover the head and shoulders of the deceased, like this piece here, and another cartonnage fragment piece also from Cooper Hewitt’s collection, 1915-24-1-b, which preserves part of a floral wesekh collar. Ava Forte Vitali is the Project Manager for the Mass Digitization Project at Cooper Hewitt. She has her Master’s in Egyptian Art and Archaeology from the Institute of Fine Arts, NYU, teaches Intro to Egyptian Art at Adelphi University and has a regular lecture series at the Morbid Anatomy Museum　on Death and the Occult in the Ancient World. She previously worked in collection management for Greek and Roman Art at the Metropolitan Museum of Art. Andrews, Carol. Ancient Egyptian Jewellery. London, 1990: British Museum Publications. Riggs, Christina. “Forms of the Wesekh Collar in Funerary Art of the Graeco-Roman Period.” Chronique d’Egypte Bulletin périodique de la Fondation Egyptologique Reine, pp. 57-68. 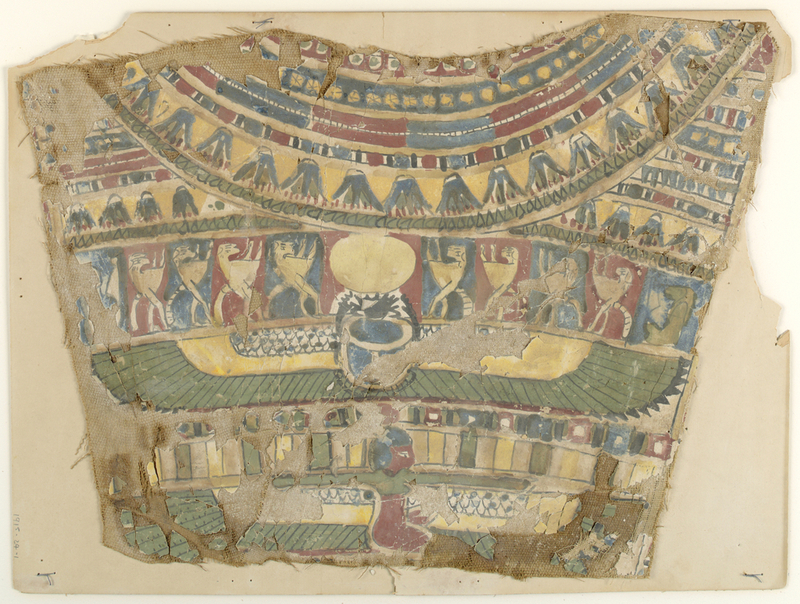 Scott, David A. and Lynn Swartz Dodd, Junko Furihata, Satoko Tanimoto, Joy Keeney, Michael R. Schilling and Elizabeth Cowan, “An Ancient Egyptian Cartonnage Broad Collar: Technical Examination of Pigments and Binding Media” Studies in Conservation, Vol. 49, No. 3 (2004), pp. 177-192. Fragment, Egypt, 1292–1190 BCE (19th Dynasty), painted gesso on linen, Gift of Robert de Rustafjaell Bey, 1915-24-1-a.